Our last Master of Design student* Bruno Brites achieved his Masters, with distinction last week. Bruno describes his project as “a personalized poetry book produced in collaboration with ACAPO (Portuguese Association for the Blind and Visual Impaired) to commemorate the 80th anniversary of the Message by Fernando Pessoa, who was one of the most significant literary figures of the 20th century and one of the greatest Portuguese poets”. 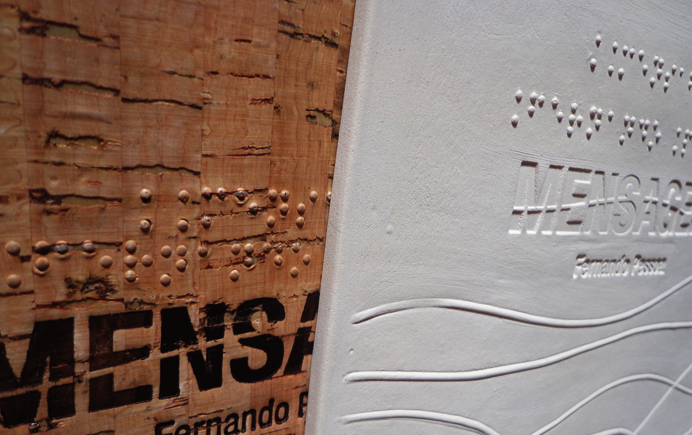 The project uses Graphic Design techniques to explore and promote Braille as a vehicle of information, as code and symbols. The research reveals layers of meaning beyond individual dots and words and act as a catalyst of new conversations about accessibility and visual impairment. Bruno’s project was an example of engaging the people who would ultimately read the book from the beginning of the design process. Whilst Bruno’s background is in graphic design, he coupled his typographic and aesthetic skills with user-centred design and spent considerable effort learning new craft skills: ceramics and bookbinding and brought them together with empathy and sensitivity. It was quite a remarkable journey. Read more about Bruno’s masters project here.